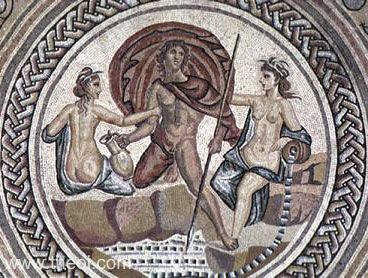 The youth Hylas is accosted by a pair of Naiad-nymphs as he fetches water from a spring. The young man wears a billowing, red robe and holds a spear and water-jug in his hands. The Nymphs are clothed in blue and one rests her arm on a streaming water-pitcher representing the spring.